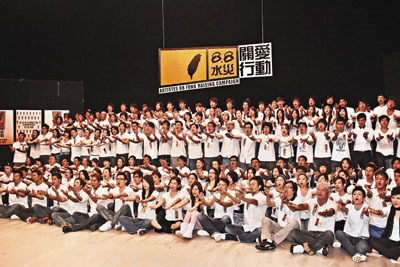 Artistes 88 Fund Raising Campaign will be held at AsiaWorld-Expo on 17 August 2009. Two nights ago, more than 200 artistes gathered at the TV city to record the song ‘Tao Tao Qian Li Xin’ which will be the theme song for the fund raising campaign for the Taiwan typhoon victims. They hope that the song would send their warmth regards to the affected sites, telling the victims that they are not an isolated group. The recording of the song is very successful, both Cantonese and Mandarin version are recorded. Andy also personally change the lyrics in order to make the recording easier, he also hold onto the large vanguard sheet writeup of the lyrics. After attending the fund raising event in Taiwan, Andy Lau immediately jet back to Hong Kong and share his experience in Taiwan. He added that most of the victims are local aborigines, they hardly heard anything outside their own villages, thus most importantly is not to let the victims feel that nobody are helping them, warmth need to be brought to them. Next month would be Andy’s birthday, Andy urge Taiwanese fans not to come to Hong Kong to celebrate with him as they could donate the money to be spent on traveling to Hong Kong, Andy promised that he will jet over to Taiwan for a make-up session with them. When asked if he know that any of the victims is his fans, he said that he understand that many of his fans are safe and sound. Other than doing his bit in organizing, Andy also donated some money with his recording company East Asia, but he does not want to reveal how much money he donated. Aaron Kowk and Leon Lai had applied leave from their film directors in order to collaborate with Jacky Cheung and Andy to perform on stage as the Four Heavenly Kings. However, only Andy is present during the song recording. It was reported in Oriental Sunday that Leon is unhappy that Andy is leading the whole event thus he order A Music singers which includes Miriam Yeung and Guang Liang to absent from the recording. It was alleged that Andy and Leon are loggerheads, even their fans could not get along. It was said that Leon wanted to redraw himself from Infernal Affairs III after he found out that Andy’s fees was higher than his. From Hong Kong showbiz insiders, although Andy and Leon are not good friends but they are never loggerheads.